FORT LEE, NJ -- A pilot captured video of a shooting star while flying near the George Washington Bridge over the weekend. Mike Grossman, of Wall Township, New Jersey, said he flew up to the city from Monmouth County for a practice flight Saturday evening, and had his wing camera running. 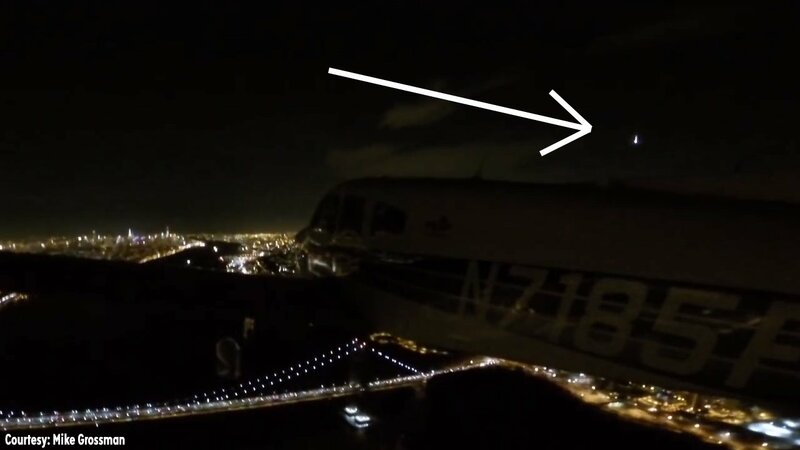 Just after 6 p.m., Grossman said he turned his single-engine Piper Archer around to go home, and saw the shooting star off to the west - just before he flew over the GWB along the Hudson River. "This was so much more than a shooting star," said Grossman, who has been flying for 5 years. "It was bright light streaking across the sky." He later looked at the footage captured by his camera, and sure enough, the shooting star was there. After Grossman posted the video online, he said a meteorite researcher from Tokyo contacted him, wanting more information. He used GPS data from Grossman's equipment to pinpoint what he believes is the place the meteorite landed - somewhere in Pennsylvania. Grossman said his footage is the first of its kind to capture video of a shooting star from an aircraft.